MONTREAL - The union representing Air Canada flight attendants urged a labour board Friday to turn aside the federal government's request to remove its members' rights to bargain and strike. "In fact, the responsibility of the board is to uphold those rights irrespective of the labour minister’s referrals," CUPE national president Paul Moist said after the union and airline participated in a preliminary meeting with the Canada Industrial Relations Board. "Those rights include workers' right to collectively bargain and strike, despite the labour minister’s blatant attempt to take them away." The union urged the CIRB — a quasi-judicial federal agency — to let bargaining continue as it seeks a deal that recognizes the "sacrifices" workers made over the past decade. The board met with both sides to begin the process of addressing two issues referred to the board by federal Labour Minister Lisa Raitt that blocked a planned strike on Thursday. A spokeswoman for Air Canada said the discussion focused on order of proceedings. "Dates for any hearings and other pre-hearing matters will be discussed further next week," said Isabelle Arthur. Moist called Raitt's intervention an indefensible "manipulation" of the Canada Labour Code and the CIRB. Earlier, a leading Canadian labour lawyer said Air Canada could be accused of unfair labour practices after it filed its own bad faith bargaining complaint against CUPE. Paul Cavalluzzo said the company's filing to the Canada Industrial Labour Board seems to violate the Canada Labour Code, which bars employers from interfering in the internal affairs of a union. Air Canada (TSX:AC.B) has accused the union leaders of not doing enough to encourage the ratification of two tentative deals that were voted down. It added that the planned strike and the union's failure to fulfil its bargaining obligations, caused Air Canada "significant and continuing losses." "Air Canada is violating the code itself by filing the complaint because in my view its complaint raises internal union issues which is certainly not the business of the employer," he said in an interview. Either way, he said the quasi-judicial board is unlikely to order any monetary damages and may end up punting the entire dispute back to the company and union. Cavalluzzo suggested the airline may be trying to get an upper hand in bargaining or trying to shore up the issues referred to by the minister. "It may just be a double whammy so to speak where we have the government and the employer trying to slam the union." He said the board will likely dismiss the complaint and won't impose a contract or even submit the dispute to binding arbitration. If the two sides can't reach agreement, the government would likely pass legislation to block a strike, he added. Raitt had given notice she would introduce back-to-work legislation but didn't do so after Air Canada and CUPE reached a tentative agreement just hours before a strike was set to begin Sept. 21. CUPE members later soundly rejected that deal. The union called Air Canada's complaint against CUPE groundless, but wouldn't say if it is considering filing its own complaint. It argued that members had the right to reject the tentative agreements even though the union executive felt they were the best that could be achieved under the circumstances. "This complaint is a complete red-herring. The suggestion the Air Canada Component of CUPE has been bargaining in bad faith is ludicrous," said Moist. "This is just another transparent attempt to stall the flight attendants legal strike until back-to-work legislation can be put in place." He said the airline should return to the bargaining table and negotiate a deal that addresses the "sacrifices its workers have made for the airline over the past decade." While a strike was averted, relations remain difficult between the air carrier and its workers — raising the possibility that future disruptions might affect the airline and inconvenience travellers. 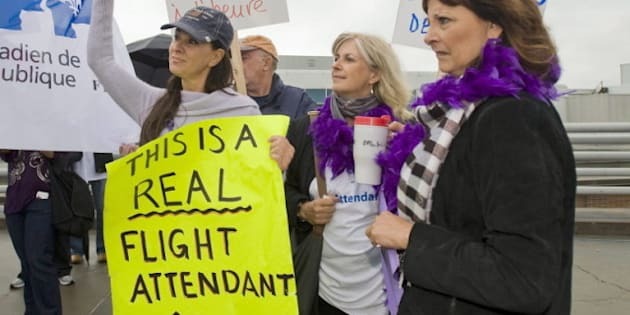 Stripped of their ability to strike, flight attendants could take job action such as calling in sick and refusing to be flexible on maximum hours worked so that return flights have to be delayed, analyst Robert Kokonis said in an interview. Employees at Australian airline Qantas and its low-cost carrier Jetstar refused to charge excess baggage fees in protest of their contract negotiations. Arthur said flight attendants "are professionals committed to customer service."